Nouveau 2009 – Available Tomorrow! 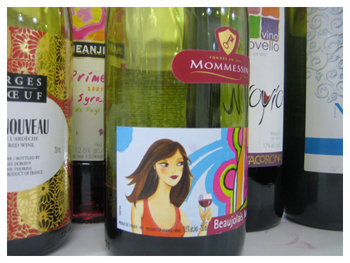 Join the world’s biggest wine party with a few bottles of Nouveau. On the day, or gather a few friends for Friday. These young, tart, light red wines are perfect in the after work time slot. Lightly chill and partner with soft runny Brie and a few crusty baguettes. Or anything from the deli counter. Keep in mind that Nouveau is created for after harvest celebrations – so let there be none of that ‘wine tasting’ carry on. The following offer a nice variety of styles. I suggest you have them in the order I’ve outlined. FYI: Nouveau is a terrific partner for the Christmas bird. . . lively with bright, fruity flavours and a slight sweetness. Refreshing and fun to gulp. . . brisk, tart and invigorating. Very Beaujolaisish. Pass the Brie. . . rustic, gutsy and almost serious. Salami please. The overwhelming favorite at my party was Georges Gamay Nouveau. Light, fruit-forward, gulpable, a bit of fizz – everything Nouveau is supposed to be.